The Grizedale Course is perfect for those staying in southern and central lakes. Grizedale Forest offers lots to of rambles and walks for members of the party who aren't taking part in the Go-Ape course....although it is great fun to be a spectator, and someone does need to be on the ground to get all those photo shoots! Jacob - 14 : It was a really fun course. Challenging, quite diverse. 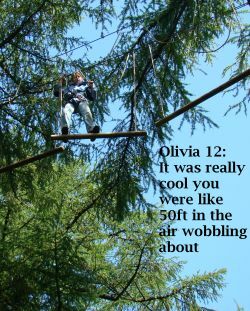 There is a lot to it - swinging, jumping, climbing and its really high up - so thrilling. It exceeded my expectaions. I'd go again tomorrow if I could. Under 18's must be supervised by a participating adult. An adult can supervise EITHER two children (where one or both of them us under 16 years old) OR up to five 16-17 year olds. The Whinlatter course is in the north of Cumbria just feet away from the Osprey web-cam and just across the valley from the Osprey nest watch. A selection of outstanding cottages in Cumbria. Whinlatter Forest has lots of attractions besides Go Ape - a new fun WildPlay area for under 13's and some lovely walks for toddlers plus and a challenging cycle route. Looking for something different? Why not try Tipi Camping in Cumbria.